Afreeca World - Invitational XXI - Summer? Big news, Afreeca World is growing up! We're back thanks to AfreecaTVs & your support I'm happy to announce the twenty first AfreecaTV World Invitational! This lineup is honestly the one I've most been hyped for. Read below and see why. 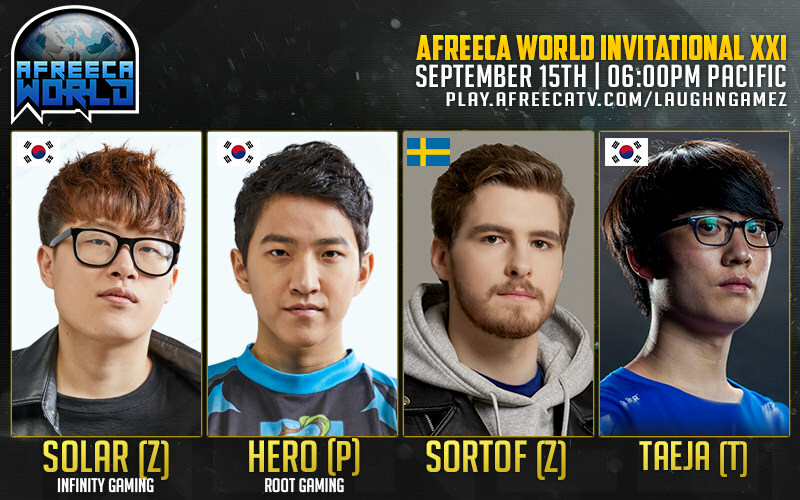 The first invite and Afreeca World tyrant is Solar the Korean Zerg who has managed to retain his crown for 4 tournaments in a row now. Solar has beaten a plethora of good players to keep his crown and will be trying to make the longest streak in this tournament. Solar's opponent is no slouch though and is looking good ROOT Gaming's herO the Korean Protoss. Solar has only played one Protoss in the past 4 events so this will be an exciting match! The next invited player seems to be becoming an Afreeca World frequent SortOf the Swedish Zerg. Last player is the guy who got me enthralled in SC2 back in the 2014 Global Finals, TaeJa the recently returned player Terran. It's exciting to have some awesome Starcraft in Korea! The debut of TaeJa in this tournament has got me really looking forward to Saturday!. Very interesting to see TaeJa in action after so long. I'm a bit late in asking this given that there's been 21 of these events, and 21 TL threads, but did you know that it's spelled "Liquipedia" and not "Liquidpedia" (and are intentionally trying to tilt Liquipedia editors by spelling it this way), or did no one ever bring this up? Regardless looks like a fun lineup tonight. It's really cool to see Taeja back in a tournament. Looks like Taeja isn't in the best shape. His army control is good but not great. Taeja looked decently competitive against SortOf, so it's not bad for Taeja. I think he doesn't remember the full range of the Queen and Hydralisk attacks. Still adjusting to the current patch, and next patch. TaeJa looked pretty good for someone discharged from army month ago. That wasn't great from Taeja. I thought he looked better during the GSL qualifiers. Solar takes it 4-1 over SortOf someone please stop this monster! VODs are now up on Youtube. Okay, losing to SortOf is disappointing after he beat Losira in the GSL qualifiers. cool concept but please try to have players of more even skill level. I just hope Taeja will get signed up by an active team and start playing again next year. He has like 4 months of preparation till the next big tournament. 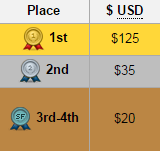 Blizzcon is off the radar for this year, he can try GLS super tournament but kind of unrealistic. Maybe a HSC presence would be nice for him, especially since he can take a top 16, top 8 there.